Motivated by the desire to reduce costs and improve efficiency, providers are purchasing and expanding their use of front-end speech (FES) solutions. Valueadds that providers talk about include reductions in transcription costs, improved documentation automation, and greater efficiency. 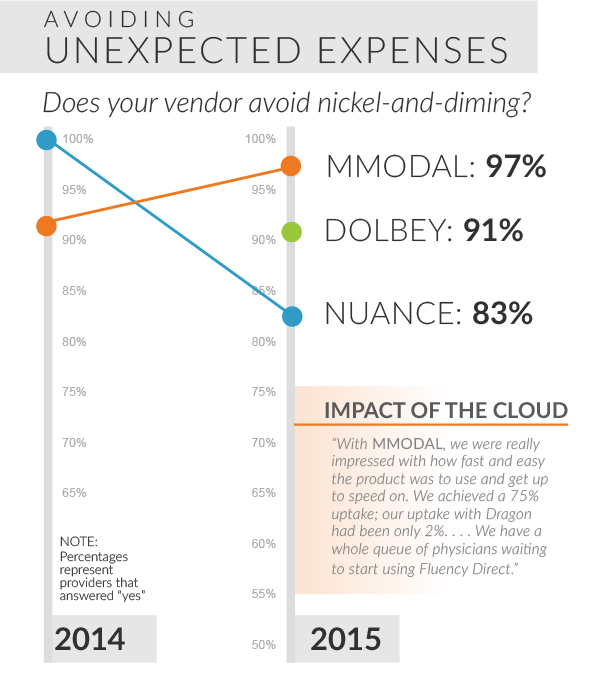 This report discusses the key performance differences KLAS has found between the Dolbey, MModal, and Nuance FES solutions and the reasons clients choose these vendors. MModal’s cloud offering wins them many clients due to its low upfront and maintenance costs, easier scalability, and much shorter learning curve. Several Dolbey clients in this report are very satisfied with significant ROIs achieved from dramatic transcription reductions. Nuance is seen as the most expensivesolution, and most clients see value from their solution and are willing to pay a higher price. However, several Nuance clients are disappointed at extra expenses from unexpected upgrades and from implementations and functionality delivery that take longer than expected. Nuance has a new cloud-based solution beingimplemented. KLAS will validate its performance when more sites come live. Though Dolbey has fewer clients than MModal or Nuance, they have continued to deliver a quality product and service to new clients amid significant growth. Multiple clients praise Dolbey’s extraordinary investment in their relationship, from the executives down to the support staff and from the implementation through the ongoing support. 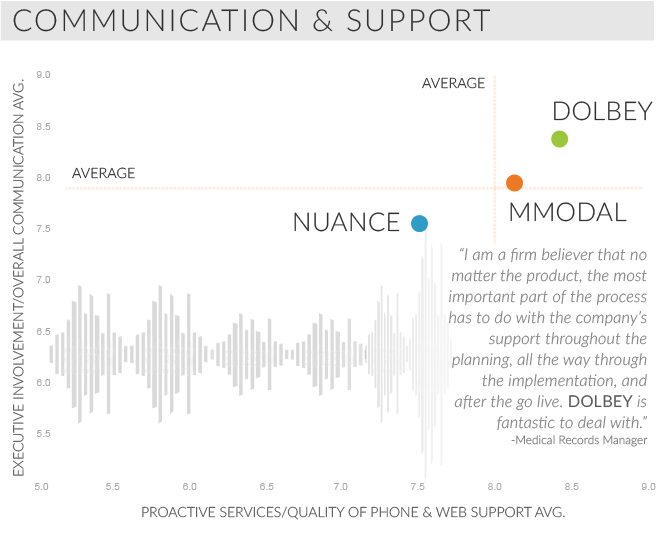 MModal’s account support is praised by several clients, and while many Nuance clients are happy with the technology and functionality, several express frustration with Nuance’s lack of follow-up when addressing challenges. Clients plan to stay with Nuance due in large part to Nuance’s strong relationships with core vendors (including embedded technology in some Cerner applications), reliable and advanced technology, and industry reputation as the perceived low-risk option. Along with Nuance’s dominant market share, they are often the only vendor considered. 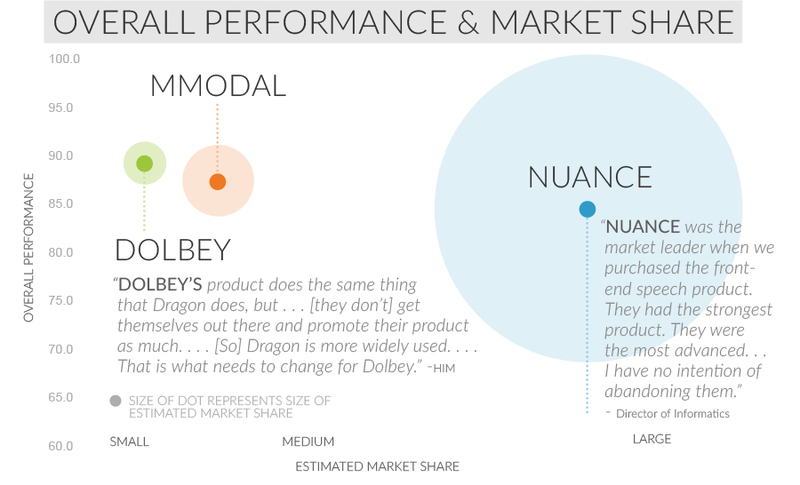 KLAS’ 2015 HIM Purchasing Plans report found that Nuance leads in mindshare among those looking to purchase or replace their FES vendor, and this is despite Nuance’s challenges with support and costs (the strengths of Dolbey and MModal). This material is copyrighted. Any organization gaining unauthorized access to this report will be liable to compensate KLAS for the full retail price. Please see the KLAS DATA USE POLICY for information regarding use of this report. © 2019 KLAS Enterprises, LLC. All Rights Reserved. NOTE: Performance scores may change significantly when including newly interviewed provider organizations, especially when added to a smaller sample size like in emerging markets with a small number of live clients. The findings presented are not meant to be conclusive data for an entire client base.